Moving time: 4 hr 47 min. Weather: 50°F (10°C) in the morning; got up to 65°F (18°C) by end of ride at 2:30pm. Heavy overcast & smoky skies. If you are paying attention to the daily mileage you will have noticed that I have not been travelling as far each day recently. I "banked" a good number of miles during the first 50 days of the trip and am well ahead of schedule. The best case scenario that I worked out before the trip put me at the Pacific coast on August 9, exactly two months from the day I started in Yorktown, Virginia. I then have 12 days to travel along the coast to Seattle and Vancouver, British Columbia before flying home from Seattle on the 22nd of August. 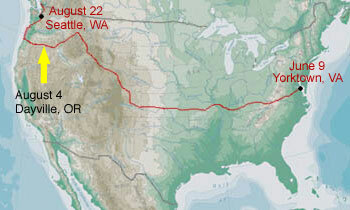 In order to reach Seattle by August 21, I only need to ride 38 miles per day. If I maintain my average of 67 miles per day then I'll certainly be able to explore much of the Pacific Northwest in the next few weeks. It will be nice to stop at some tourist attractions and museums along the way. The first seven miles of today's segment took me over Dixie Pass, a 1000 foot ascent. 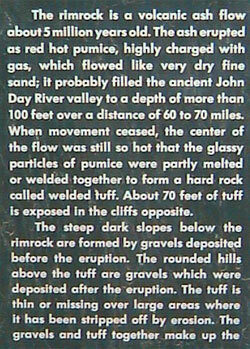 The next 53 miles followed US 26 along the John Day river through Prairie City, John Day, and Mount Vernon to end in Dayville. As I descended from Dixie Pass it was clear to me that the skies were full of smoke from nearby wildfires. The mountains are blanketed with white and brown smoke and the air smells of burning wood. You can see just how hazy the conditions are in the picture below. In two days I will pass very near a major wildfire that has burned thousands of acres near Santiam Pass about 15 miles west of Sisters, Oregon. 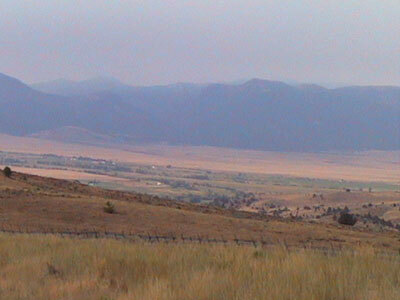 The winds picked up as I descended into Prairie City. Headwinds again. There's nothing that tires me out more than riding against the wind. Perhaps it will be calm tomorrow. People do one of three things around these parts: farm, fight fires, or feed farmers and firefighters. Fighting wildfires is a huge business here in the west and thousands of firefighters are employed to conduct controlled burns and help contain out of control fires. Each day I see dozens of trucks and buses full of men and women clad in yellow shirts, green pants, and leather boots. They stop by the same places we do for food, water, and relaxation and I've had the opportunity to speak to quite a few of them. They have a hard, tiresome job that seems to be in very high demand this season. 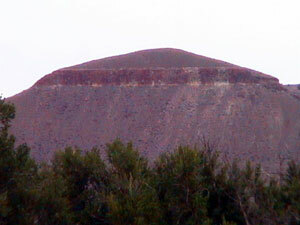 There is a very distinct layer of rock in the mountiains that run parallel to and north of the John Day river near Dayville. 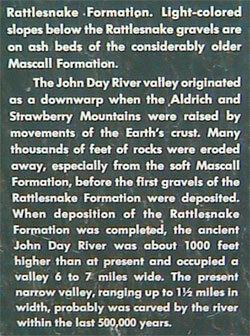 Here are some pictures from the interpretive plaques and a few shots of the distant ridge. Here are a few miscellaneous pictures from today's ride. 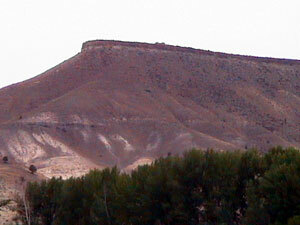 The first shows the typical scenery of the John Day River valley floor. 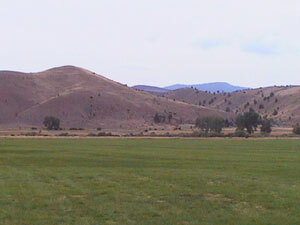 The river flats are irrigated and support quite a few dairy and beef farms as well as an occasional horse ranch. 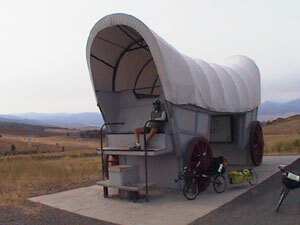 The second shows me sitting in a huge Conestoga Wagon trying to warm up after a cold descent from Dixie Pass. Joe and I stayed at the Dayville Presbyterian Church hostel. They have hosted cyclists in their parish hall since the inception of the TransAm route in 1976. It is the only church hostel along the route that has shower facilities, a necessity since I didn't have a shower yesterday. 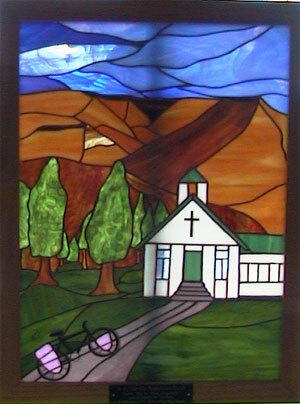 Two cyclists from Coos Bay, Oregon made and donated this stained glass window to the church in appreciation of what the congregation does for cyclists. The church and background mountains closely resemble the real thing.